Being an engineer and an automotive enthusiast as past blog articles might tell, I'm in general very interested in transportation related sustainability initiatives that attempt to plant seeds now for a long-term alternative energy future. Within the UAE, this long term vision, that I think is very well outlined in the UAE State of Energy Reports (SEOR), can be considered nothing short of a sea-change. First, a pertinent reminder is that transportation accounts for some 17-20% of UAE’s total CO2 emissions according to aggregated statistics in World Bank Indicators. Secondly, the positive sectoral energy trends in UAE transportation are worthy of mention. The UAE Supreme Council of Energy has made it a long term policy to enhance sustainable transport. Both Abu Dhabi and Dubai have made headway into understanding the transportation emissions issue and solutions have been implemented. Some examples are required to put this into context. Announced in 2015 was the development of a Federal energy policy, which aims to supplement the Climate Change Strategy for the Emirate of Abu Dhabi and the Dubai Integrated Energy Strategy (DIES). Another historic development in the same year was the nationwide reforms of fuel subsidies to better reflect real energy prices vis-à-vis world trends. Even though fuel is currently cheap, it is no longer pegged and is subject to increase. Therefore, drivers will have to live with the idea of paying out of pocket for what was previously externalized - the energy security of fuel. The Dubai metro and Dubai Tram systems, since their introduction, have diversified public transportation infrastructure in a way that doesn’t tax the road traffic system. According to earlier numbers from the RTA, the Dubai metro serves around 500,000 persons a day. That's 500,000 people kept away from the roads by being offered another mode of transport. This is significant. Within road transport, the initiative towards introducing CNG into the transportation fleet and diesel made with a portion of waste cooking oil are worthy of mention. The RTA’s current fleet of buses are designed to Euro 4/5 emission standards and low sulfur diesel (10ppm gasoil) has been made available to maximize the benefit from these systems. Alongside the push towards alternative fuels, there are official moves to introduce EVs and hybrid vehicles and a network of charging stations as infrastructural support. The market for hybrids has already been set into motion this year. 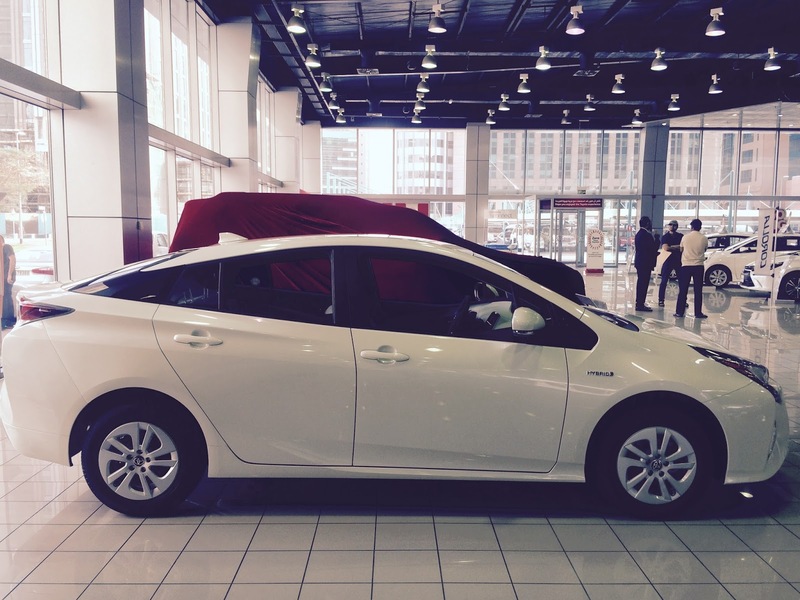 The Toyota Prius Hybrid, a road worthy hybrid car well established in the U.S, was officially launched in the U.A.E in January. After seeing the 1.8L hybrid on a test drive, it comes to my knowledge that it has nearly 71 HP of output from just the motor generator and an impressive 121 HP from combined engine + motor operation. Having personally driven this vehicle, I can tell you that the transition between engine and e-motor operation is as smooth as a baby's bottom. At present, the hybrid car is a suitable answer for those in the UAE looking to travel medium to long distances without having to become battery charge anxious. Those who could could care less can opt for PHEVs and BEV's that are fully electric. While there are reports of people privately importing Teslas and other electric cars into the UAE for personal use, the market in this segment has yet to go mainstream in the emirates. Analysts who are fairly entrenched in old style economics look at these developments and cite various reasons to stay away from electric cars. The Tesla, in spite of significant developments that come as a technology disruption for conventional cars, has unfortunately become the poster child for critics. For example, Robin Mills in an article to the National, is partly correct in stating that electric vehicles are only as clean as their energy source. But he stops short of developing his title any further than the headline, while the body of the article is mostly centered on Tesla, a car not sold in the UAE. While the fully electric vehicle might take longer to be introduced in the UAE, the cost conscious Mills overlooks the interim development of the introduction of a hybrid vehicle in the country. Infact, the first cost of a Toyota Prius Hybrid is on par with that of a basic 2016 Honda Accord LX, with the latter's price significantly increasing for add-on options. Therefore, it's 92,600 and change for the Prius vs 100,000 AED or more for the Honda. We can also assume some level of dealership programs incentivizing potential buyers of the hybrid since it is the first introduction in the UAE. This has potential to knock off additional numbers from the sticker price of these cars. Critics like Mills often point to the out-of-pocket first costs of these cars as a reason to be cautious of adoption. But as I mentioned before, this is old style economics that does not work for a post COP21 world anymore. Consider the fact that there is a growing body of research into the climate forcing aspects and human health effects of GHG and air pollutants. Some widely cited atmospheric research studies talk about coupling between GHG and air pollutants in a way that further enhances the overall net climate forcing. Therefore, one is forced to re-think a "black and white" approach for a more nuanced understanding of our climate system where myriad sources, sinks and interdependencies are more complex than previously thought. Looking to the past 3 National Communications that the UAE has submitted to the UNFCCC, the last emissions inventory done for base year 2005 reflects the fact that that transport sector CO2, N2O, NOX, CO, NMVOCs and SO2 emissions were 23%, 5%, 18%, 36%, 28% and 40% respectively of the total emissions profile of the energy sector. This should not come as a surprise because at the root of this challenge is population growth, the growing vehicle numbers in the UAE and the growing use of transportation fossil fuels over the last several years. One study I did recently looked into this trend over a multi-decade timeline. I present two plots below (forgive me for how busy they look). Note that the black circles show the number of total vehicles in the UAE for the years in which data was available. Fuel consumption is indicated in Terra Joules to associate emissions with the absolute energy content burned in the transport sector. The plots shown above are distinct to the national and local urban circumstances of the UAE but as indicated before, the initiatives taken within the various UAE sectors to move away from these unsustainable trends should be commended, rather than criticized. The introduction of hybrids in the UAE are a tiny drop in the ocean of what can be broadly called strategy. I personally don't see fully electric vehicles for pas-car being introduced until the energy source for charging EV's and their charging stations come predominately from clean sources of energy. At-least this is what makes sense from a well to wheel standpoint. The numbers to be remembered are 7% and 5%, i.e in Abu Dhabi, the leadership has committed to secure 7% of its total energy needs from renewable sources by 2020 while Dubai has committed to a 5% target. Therefore, I see a push into marketing full EVs falling in line with those targets whenever they materialize. On this basis, I see little cause for concern just yet and it is premature to criticize a Tesla adoption in the UAE. The other aspect that I reminded Mills on Twitter about are the external costs of using conventionally fueled cars, which his article fails to make a note of. Studies on air pollution costs have recognized impact categories in health costs, building and material damages, cross losses in agriculture and impacts on the biodiversity and ecosystems. Experts in Europe have already put monetary numbers into these damages. Just as an example, chronic health effects are valued at a recommended value of €50,000 while acute health effects have a recommended value of €75,000 per year of life lost. Now multiply that with the number of people admitted as respiratory and cardiovascular patients and years of life lost and one should get an economic perspective on the magnitude of one category of air pollution costs. Moreover, we also know from WHO studies that Ischemic heart disease which happens to be the number one killer of people in the world has statistically significant association with air pollution. Total person deaths in six GCC countries due to respiratory infections, respiratory and cardiovascular disease are shown below for year 2012. I rest my case that to even begin to understand how some initiatives like electric vehicles contribute in the long run means to come to the table and frankly discuss all the social and monetary damages that using clean energy offsets. It is definitely not over-hyping anything. Looking at the current state of affairs, I observe that critics of clean energy have yet to shift away from short term rudimentary types of analyses which is quite unfortunate. Here's hoping that this mindset shifts quickly in the UAE and elsewhere in the world. Polluted air comes with undesirable health consequences for our bodies and our planet. Electric charging stations can solve this pollution issue.